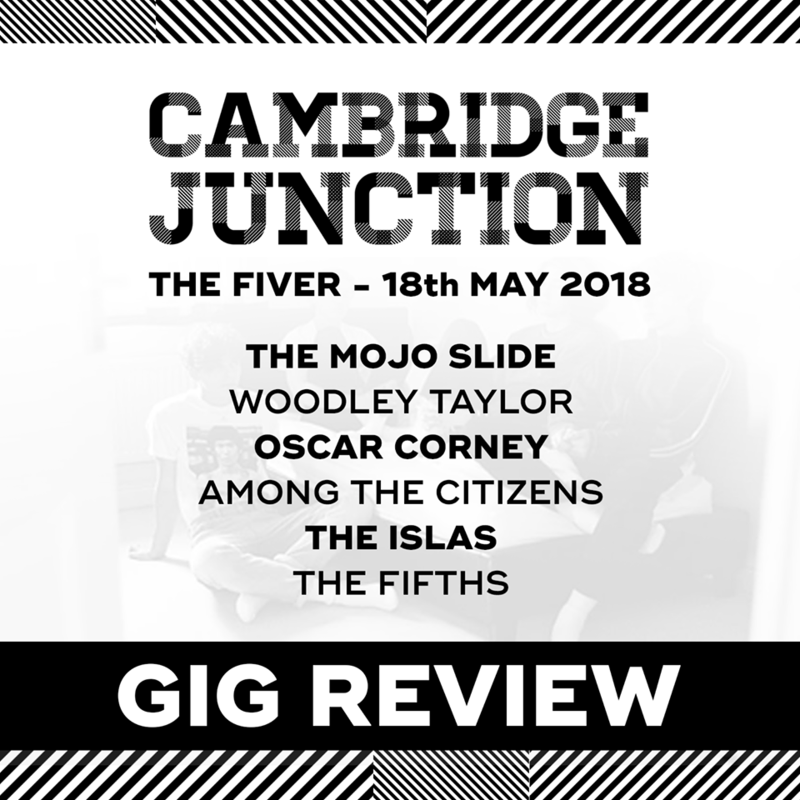 May’s edition of the long-running The Fiver night saw six bands play awesome sets at the Cambridge Junction. Haverhill’s The Fifths kicked off the night with a highly commendable set, with each member brimming with confidence throughout. Not only did they play a cover or two, the band played some great original tracks like Chance It and They Should which are on their Soundcloud. Their set was definitely one of the highlights of the night, and for a band that formed only six months ago, the future looks bright for them. The Islas, from Norwich, were up next, a band who were playing their first ever show in Cambridge. The four-piece indie band played an energetic 30-minute set full of cheeky crowd interaction and some really nice indie-rock tracks, notably their recently released debut single A Generation To Forget. An EP is set for release in the near future, an exciting prospect on the basis of their performance. It’s fair to say that Among The Citizens are the most exciting band to have come out of Peterborough for a while now. Their awesome new single Mess In The Head closed their set, which included tracks from their 2017 EP Unlearn You, mixing in intricate guitar melodies with more electronic-based sounds. The band have a fair amount of gigs coming up, including a slot at Homegrown Festival on 9th June. Oscar Corney was up next with a really pleasing set. His inch-perfect vocals were brilliantly complimented by his backing band as they played some great memorable tracks from his previous EP’s like Be Someone and Your Fool. Corney has had a great start to 2018 reaching the final of the Cambridge Band Competition, and with new music hopefully on the way, the year could get even better for him. With The Junction swarmed by his passionate fans, it’s fair to say Woodley Taylor put on a show with his 30 minute set. His classic rock-inspired tracks like Smoking At Midnight and Runaway showed off his soulful vocals and talented backing band. Taylor closed his set with Breathe A Little Deeper, with the audience chanting back every word to the very professional soloist. A really enjoyable set. The last act on were The Mojo Slide, a blues rock band from Cambridge. The band formed in 2011 and their experience showed as they put in a great performance, with some catchy tracks from their 2015 album Twist Your Bones, and some smooth guitar riffs really connecting with the crowd. The Mojo Slide also have a lot of live shows coming up, all information is on their Facebook page. The next Fiver is 15th June featuring Cambridge Band Competition winners Influx of Insanity! aren’t The Fifths from Cambridge?